Scientists have found a way to generate and maintain stem cells much more efficiently by amplifying the effect of an essential protein. Researchers from Denmark, Scotland, and the USA have created synthetic versions of a protein, which manipulates adult cells – such as skin cells – so that they can subsequently revert to an earlier, embryonic like state. These reverted cells have the potential to become any cell in the body. As well as reverting adult cells to this state – known as induced pluripotent stem cells, the protein also plays a key role in maintaining embryonic stem cells in a pure form. If the protein – Oct4 – is not present, the embryonic stem cells will start to differentiate into specific cells. In order to reprogram adult cells to have stem cell properties viruses need to be added to cell cultures to trigger production of significant quantities of Oct4. Oct4 plays a powerful role in regulating stem cell genes. However, while large quantities of Oct4 are needed too much of it can ruin the properties of stem cells. Scientists were able to overcome this by producing a synthetic version of Oct4 that amplified the effect of the protein in its natural form. The synthetic version of Oct4 was much more efficient in turning on genes that instruct cells on how to be stem cells and, as a result, the cells did not need as much Oct4 for either reprogramming or to remain as stem cells – thereby eliminating problems caused by too much Oct4. In fact, the synthetic Oct4 could support stem cells under conditions that they do not normally grow. These findings could also help scientists find new ways generate stem cells in the laboratory. The study showed that Oct4 was mainly responsible for turning on genes that instruct cells on how to become stem cells, rather than turning off genes that encourage the cells to differentiate. “Our discovery is an important step towards generating and maintaining stem cells much more effectively,” says Professor Joshua Brickman, affiliated with both The Danish Stem Cell Center (DanStem) at the University of Copenhagen and the Medical Research Council Centre for Regenerative Medicine at the University of Edinburgh. Oct4 is a so-called transcription factor – a protein that binds to specific DNA sequences, thereby controlling the flow (or transcription) of genetic information from DNA to mRNA. The synthetic version of Oct4 was created by using recombinant DNA technology whereby a gene was modified to produce new and more active protein. The modified gene was either introduced into stem cells or used to reprogram adult skin cells. If scientists can exploit this programming of stem cell programs, it will improve the ability to generate stem cells directly from a patient. These cells could in turn potentially be used for individualized studies and for developing individualized therapies for degenerative diseases such as type 1 diabetes and neuro-degenerative diseases. 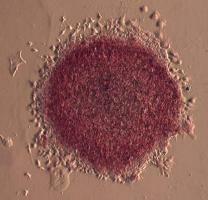 Illustration: Embryonic stem cell colony in a petri dish. Image by Fella Hammachi.